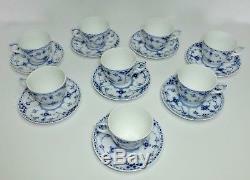 Tunning lot of retired demitasse cups and saucers in pristine condition. 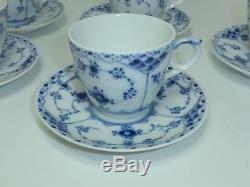 Cups are 2 3/8", saucers are 4 1/2" in diameter. These items are first quality and hand-painted by artisans in Denmark, therefore no two pieces are exactly alike. 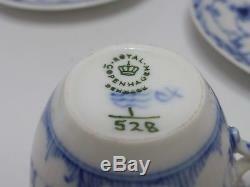 Please see our other Royal Copenhagen listings! 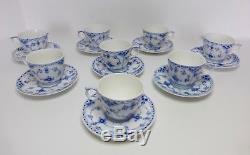 The item "Lot Of 8 Royal Copenhagen Blue Fluted Half Lace Demitasse Cups & Saucers #528" is in sale since Monday, September 11, 2017. 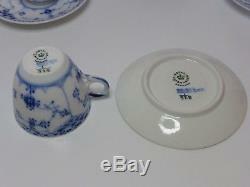 This item is in the category "Pottery & Glass\Pottery & China\China & Dinnerware\Royal Copenhagen". The seller is "serendipity303" and is located in Littleton, Colorado. This item can be shipped to United States.